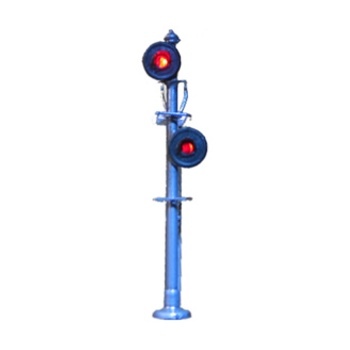 Tomar Industries Offset N-Scale Double target signal with a two tri-color LED. 2 groups of 3 wires on the bottom of the signal, each group controls a signal head. The White wire is the (-) common. When the Red wire has power you get a Red Signal, the same with the Green wire illuminates the LED Green. If both the Red and Green wires are powered at the same time you will get a Yellow indication from the LED.